Here an audio of Nyoka Longo being dissapointed in one of the 4 musicians who ran away and the musician replying calling Nyoka Longo "Petit Nyoka" and saying that he's a faux chanteur. People on facebook are claiming that it was Lola Muana. In the Congolese music-scene when a song is credited to an artist (auteur/compositeur) then it means that the text of the lead-singer and refrain are from the artist. The vocals of singers, melodies of the instrumentalists and cries doesn't count. The singers & instrumentalists comes with their own contents. In the 80s, 90s and 2000s, the guitarists were coming with the instrumentalisation first and the atalaku then fiding somehing to fit in. But now its the opposite. Hence why alot of sebenes are flopping today. Since 2006/07, it are the atalaku's who are directing the guitarists which makes sebenes having to much transitions and breaks, because of the atalaku (Lobeso, Brigade, Gentamicine, Bercy, etc.) coming with "aaah rrrrrrrrr" and the lead guitarist having to stop with the rhythm guitarist and they keyboard-player taking it over. By making a song they come first with the lyrics and the instrumentalisation of the song later. 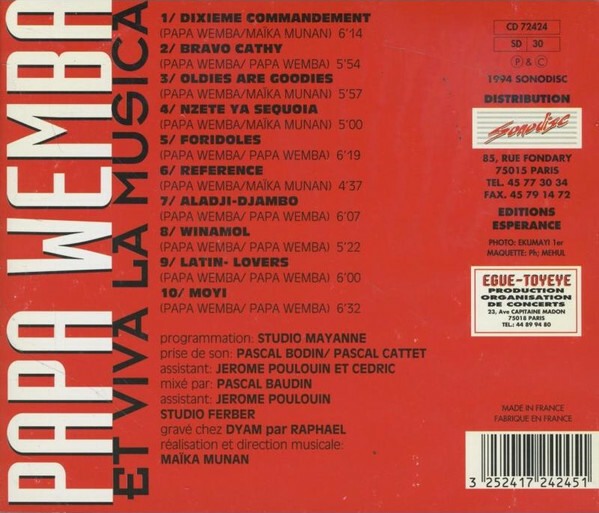 That's why Maika Munan, Souzy Kaseya and Sec Bidens were crediting themselves as composer of Papa Wemba songs, because of them coming with the instrumentalisation. Alain Makaba did the same thing on Anges Adorables volume 1 & 2. The real songwriter of Voyage is Pascal Poba. Voyage Mboso is seen as the best song of Wenge 4x4 and I think also that it is the best song, but I prefer Mon Ami Coboss of JB Mpiana and Tchatcho Mbala "Jugement par Defaut" of Werrason (which is about to not judge people from far, but to aproach the person and know how he is). The old generation was also liking Voyage, because they saw that it was the only song that made sense lol. 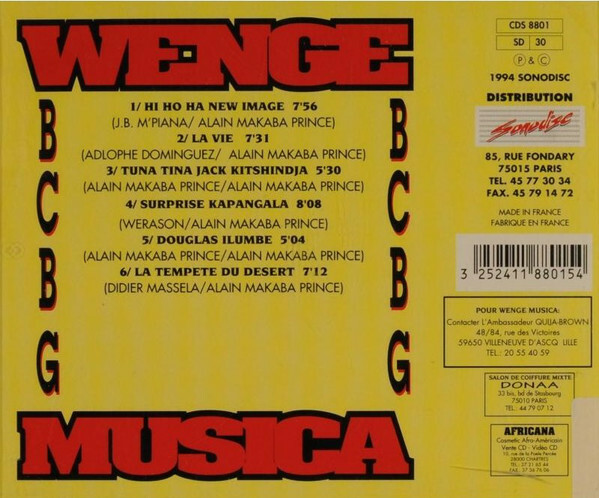 I think that Werrason's best vocal in Wenge 4x4 is the one he made in Coco Madimba "tolingana" followed by the one he did in Kaskin for his wife Mampata "ata ba tongi nga....". Reddy is starting to become very annoying these last years. 2 years ago he attacked Awilo Longomba during Naty Lokole's interview and when Papa Wemba died he attacked Koffi Olomide, claiming that Koffi was appropriating it while it was Willy Kayembe who came towards Koffi for an interview. Because on the day Wemba died, he was supossed to present Koffi Central. Last year he attacked Manda Chante. I think that Reddy is still furious about Felix Wazekwa helping Papa Wemba back on the top with Foridoles and the Pole Position. Because before 1994 Wemba was really down and Reddy's albums were really succesful with people claiming that Wemba was profiting from Reddy's succes. Congolese Music / Re: Who's the real author ? Djuna Mumbafu or Gode Lofombo ? They didn't release an album when Djouna was around. Lofombo is a sound-engineer so its normal that he mixed the album. He helped with the production of Confirmation, because their producer (Rigo Makengo) wasn't really able to promote their album well. If they had still Somina Nadim as producer (was very dissapointed when Djouna left) then it would have been a different story. It was himself Lofombo who made Djouna the president of Delta Force. Djouna didn't want to do music anymore and was staying at home for weeks not knowing what to do. Lofombo was about to join Big Stars, but those musicians of Delta Force were following everywhere since that they didn't want them in Empire Bakuba. So Lofombo decided to form a band, but he didn't had money and didn't believe that they would succeed. So he contacted Djouna Mumbafu, because he knew that he had some money, alot of connections who could support the band and had some charisma. Djuna Mumbafu accepted Lofombo's offer and they started to recruit some other musicans to complete the band (Ile de Camboge, Bruno Nsona, Serge Liaki, etc.). Then when the fame came, Lofombo couldn't handle that all credits went to Djouna Mumbafu and the people close to him were making it worser by saying things like "how can Djouna become your president while you did everything, etc." with all misunderstanding starting from then. Until that Delta Force split after 6 months or something like that while they were about to go Europe and preparing their album. Lofombo said 10 years ago that he didn't like the way Djouna become the new Pepe Kalle and himself staying Lofombo adding that it was a big mistake to make Djouna the president. For me Lofombo had just to accept Djouna to be the president. I'm sure that they would have been very far. Okay lets try to decipher it a bit. Lets look at sebenes before and sebenes after. What were some really good sebenes of the late 80s guys? Each band had is own style of playing sebene in the 80s. You had TPOK Jazz, Zaiko Langa Langa, Victoria Eleison, Choc Stars, Viva La Musica, Afrisa, Empire Bakuba, etc. It wasn't like in the late 90s when almost every band in Kinshasa had the same style of playing sebene. I don't which style you like, but if you like to dance alot then I would choice Zaiko for you. No, because Nono Monzuluku & Bebe Atalaku were the first atalaku's in the Congolese music-scene joining Zaiko in 1982. They came from Bana Odeon and came with those Humbu-animations. Then you had Ditutala of Choc Stars who came also from Bana Odeon. Djuna Mumbafu was the man who came with a new style and he was the first atalaku who really knew how to dance. He joined Empire Bakuba in the late '80s and from then Pepe Kalle came with the concept that he know today as generique. It's also because of him that the ACMCO came with "the best atalaku of the year" category. I can understand why he used to furious for not getting a medal from mérite des arts, sciences et lettres back in 2015 when other artists used to get in Kinshasa. Robert Ekokota had the same style of Djuna Mumbafu. When you are talking about revolutionizing sebene are then talking about guitarists or atalaku's ? Durrel Loemba never used to be a singer. He used to be a rhythm-guitarist in Extra Musica BPBL and became a lead-guitarist when he created Extra Musica International in 1998 with Quetin Moysacko. Espe Bass was even surprised when he heard that he started singing and started laughing. I think that it still hurt him how Z1 International collapsed because of Regis Touba wanting to be the only leader and the most focus of the public being on the singers instead of guitarists. Djouna Mumbafu doesn't have a grudge to Dilu Dilumona and Papy Tex. He even particpated to Dilu's unreleased album of 2012 and started to visit him sometimes when he was in Kinshasa. Djouna didn't had a problem with Papy Tex and Papy was in Paris when Pepe Kalle died and when they forced Lofombo and Djuna out from Empire Bakuba. Papy Tex even tried to convince him to rejoin Empire Bakuba back in 1999 when he came to Kinshasa, Djuna accepted his offer but with the condition that Lofombo wouldn't be there. I watched Djouna's interview with Ado Yuhe and he didn't said something bad about Lofombo. He just explained what made him leave Delta Force, it's Ado Yuhe who tried to push the whole interview to say something bad about his departure from Empire and Delta Force but it didn't work. Ado said at some point that Lofombo complains about Djuna calling a witch while its the opposite, that was the only thing that Djuna made furious in the interview with him saying that if they made a briefing before interview that he wouldn't let accept that question in the interview. Djouna didn't name out respect some members of Empire Bakuba who didn't want him anymore (I guess that Boeing must be one of them) and who claimed that he stole Pepe Kalle's ring (which had apparently magic powers), but it wasn't Dilu Dilumona and Papy Tex. Djouna was waiting for a reaction from one of them on Ado Yuhe's show, but it didn't happen otherwise he would explain it all clearly. I noticed that i posted the wrong song lol.